Nelson County’s new sheriff is a veteran of the office — and the Army — having served with the local agency for about 12 years. 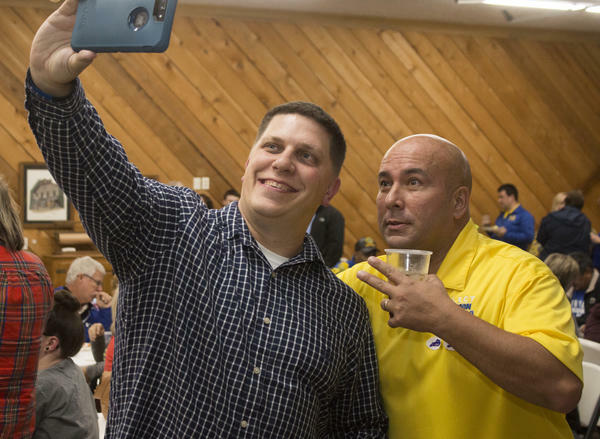 Ramon Pineiroa, right, celebrates with Joedy Gilliland after winning his bid for Nelson County sheriff. Ramon Pineiroa, a Democrat, defeated Republican Todd Harper in Tuesday’s general election. Unofficial results indicate that between absentee ballots and 24 precincts, Pineiroa received 8,425 votes, while Harper received 8,028 votes. As precinct returns gave early indication of a win for the Democratic candidate, Pineiroa told The Standard the victory came from a lot of teamwork and community support. He called the victory and support rewarding, but he also said the race for the general election was a “good one,” as was the primary. “He surprised me with how many voters turned out to vote for him,” Pineiroa said of his Republican opponent. The sheriff’s seat came open in January following the retirement of Ed Mattingly, who had served in the role since 2014. Mattingly cited uncertainty over public pensions as a reason for his decision to step down. Mike Newton was later appointed to fill the remainder of Mattingly’s term, but had no intention of running to keep the position. Pineiroa filed for the office last November and won the Democratic nomination in May in a three-way race. In his campaign sporting bright yellow and blue signs and T-shirts, Pineiroa emphasizes professionalism, accessibility and accountability. He has also stressed his ties to the community and volunteer work for civic and youth sports teams. Suggestions made by the candidate during his campaign include increasing narcotics investigations, increasing deputy presence on the road and enhancing courthouse security. In political debates with his Republican challenger, Harper, Pineiroa also suggested bringing in a short-term contractor to look into the investigation of local mother Crystal Rogers’ 2015 disappearance, as well as other unsolved cases in the area. Harper wanted to hire a full-time detective dedicated to that task. Pineiroa started with the Nelson County Sheriff’s Office in 2006 after serving nine years in the U.S. Army, which included two tours in Korea. During his time with the office, Pineiroa advanced from deputy to assistant sheriff, a position to which he was named by Mattingly. He served in that role until the office was reorganized and Capt. Mike Clark was named second in command. Pineiroa lives in Bardstown with his wife, with whom he has three children. As he prepares for his new role, he plans to take a brief vacation with family and friends, “and then come back and get to work,” he said.